Soups are really comforting and filling for me. My craving for soups kicks off along with winter. Potato and Leeks is the most common among the soups made with leeks, but I wanted a lighter one with leeks so just replaced potatoes with carrots and added few ingredients to suite our taste. The mild onion flavor of leeks and carrots blends really well. This soup is simple to make and equally delicious. Serve it along with a green salad and warm sandwich. This soup is very light and also the flavors intensify by the next day, so you can easily make this dish any time. 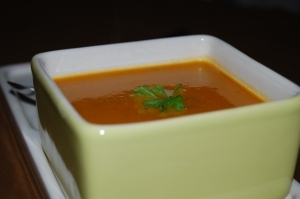 Orange juice not only adds a nice citrus taste also gives a beautiful orangey color to the soup. Clean and chop up the tender part of the leeks (discard the leaves, green ones) and celery stalk along with leaves. Cut the carrots, peel and roughly chop ginger. Heat the oil in a saucepan and sauté ginger, celery and leeks gently for 5 minutes stirring occasionally, until the leeks are soft and transparent. Add oregano, black pepper and carrots, sauté for 2-3 minutes. Stir in the stock and bring to the boil. Simmer for 10-12 minutes or until the vegetables are tender. Remove from heat and cool down. Puree the cooked veggies in a food processor or in a blender. Pour the mixture in a saucepan, stir in orange juice and parsley and cook on low heat for few minutes. Adjust the seasoning, garnish with parsley leaves before serving. You can substitute orange juice with milk or stock. If you want a spicy soup replace oregano and parsley with curry powder and coriander leaves. And finally, thanks bee for reminding “Click-Liquid” event, here is my warm blow of soup for you folks. Enjoy!! That picture looks awesome… Ur new layout looks wonderful Shivapriya. Happy New Year! Delicious. Leek’n’ ginger soup is a favourite. I’ve never tried it with carrots, we’ve always used potato to make it more chowder-like. yummy. that would be a great entry for click. Happy New Year Padma, good to see u back. Thanks kaykat, I know potato n leeks tastes delicious but this is much lighter and tastes really good, try it sometime. Thanks TBC, wish you the same. Oh yaa, this month’s click is liquids. Thanks for reminding me. Will send it. Its was really good, even I love leeks in soups. looks great Shivapriya 🙂 happy new year to you! Thanks Roopa, and wish you the same. Nag, this is a nice refreshing and easy soup to make. Try adding fresh orange juice it tastes really good. Yep Asha, blogs are warming up with soups:). I got that bowls set from Ikea. I love how you create such interesting and tasty soups! I always make potato leek soup but never thought to try leeks with any other soup (except maybe chicken soup). I will be trying something like this soon! I hope you are having a wonderful vacation and can’t wait for you to return to blogging! Thanks for this–it was exactly was I was looking for! I am usually no good at following recipes (I always adjust and am just no good at following directions) but, this was perfect and I am so excited to make your pav bajhi! Haven’t had it in yeeeaars. Love your blog! So glad I stumbled across it..